The Greek parliament has approved a three-year, €85bn rescue package following a night of debate and delays. Prime Minister Alexis Tsipras was heavily reliant on support from the opposition in getting the vote to pass, following dissent from radical left hardliners within the governing Syriza party. It was crucial that the bill passed this morning, as eurozone finance ministers are due to meet in Brussels this afternoon, where they will decide whether to approve the draft agreement. Other hurdles before initial bailout funds are released include votes in the parliaments of other Eurozone nations - including Germany, which has been one of Athens' harshest critics. Ahead of the vote, Syriza rebels accused Mr Tsipras of reneging on the anti-austerity pledges which had seen the party elected to office. One prominent party member, Panagiotis Lafazanis, told the Prime Minister: "I feel ashamed for you. We no longer have a democracy ... but a eurozone dictatorship." He and 12 other left-wing politicians are intending to start a rival anti-austerity movement to Syriza - but have not quit their current party outright so far. However, Mr Tsipras has defended the bailout plan, explaining: "We took a painful decision of responsibility, and took a step back. Our position cannot be served by escape or by fantasy. "We took the decision to remain alive instead of committing suicide and complaining how unfair it was." Greece needs to complete the bailout deal with all relevant parties by 20 August, as this is when a €3.2bn debt repayment to the European Central Bank is due. 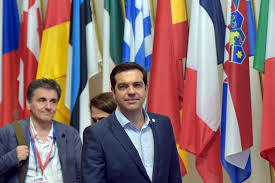 However, there is a contingency plan in case the bailout deal is not achieved, as the European Commission has been told to draw up proposals for an interim loan which would allow Greece to pay its bills if eurozone members reject the plan. Mr Tsipras has claimed that the German Finance Minister, Wolfgang Schaeuble, would rather see Greece kicked out of the euro. "In a few hours ... using unfair arguments and unfair demands, there will be an effort from the side of Mr Schaeuble to take back what has been agreed," he warned. "That would not be a defeat for the Greek Finance Minister, or for Greece, but for Europe."